Home > News > Confirmed: Silver K-5 and a lot more! Confirmed: Silver K-5 and a lot more! 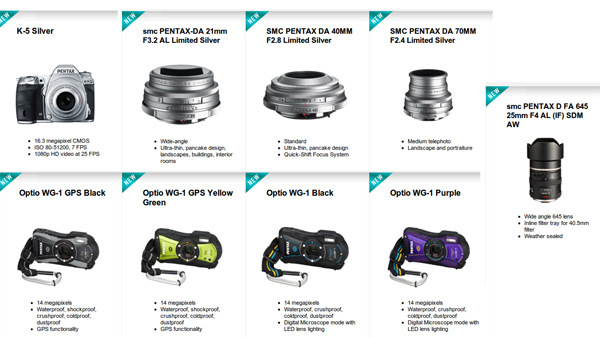 Pentax USA just confirmed that the K-5 in silver will be released here. To go along with it the 40mm, 21mm and 70mm will be sold in silver. Another interesting product is the new pocket-able waterproof camera, the OPTIO-WG1. That looks like a seriously useful digicam. Waterproof, GPS, and substantial rubberized construction. The 645D also has a new wide angle lens available. This entry was posted in News and tagged 645D, k-5, limited, silver. Bookmark the permalink.